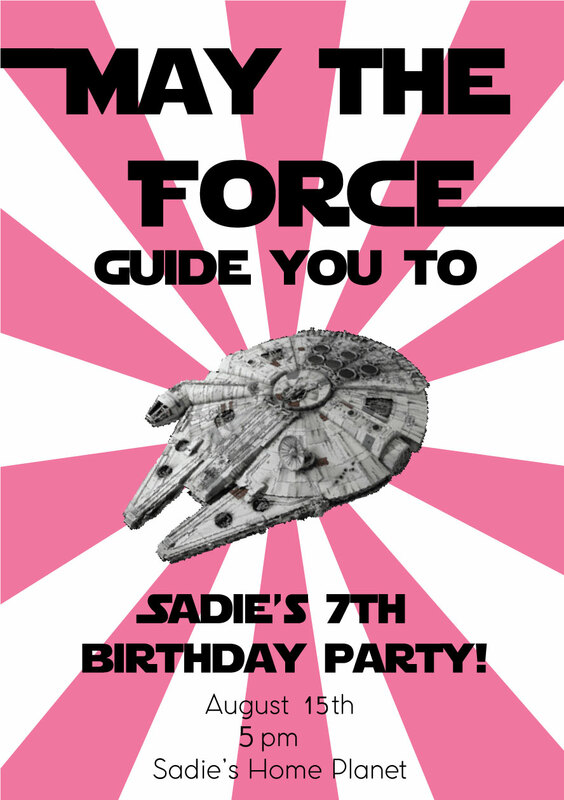 Let’s start with the invite-I obviously made good use of the Star Jedi font for this party! Used it for all the signage etc! 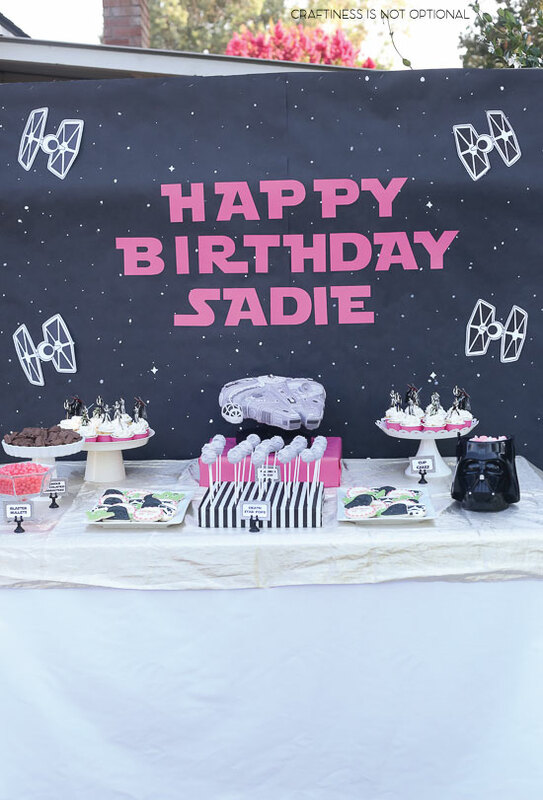 Also used it to cut out the hot pink lettering for the backdrop on my Silhouette! 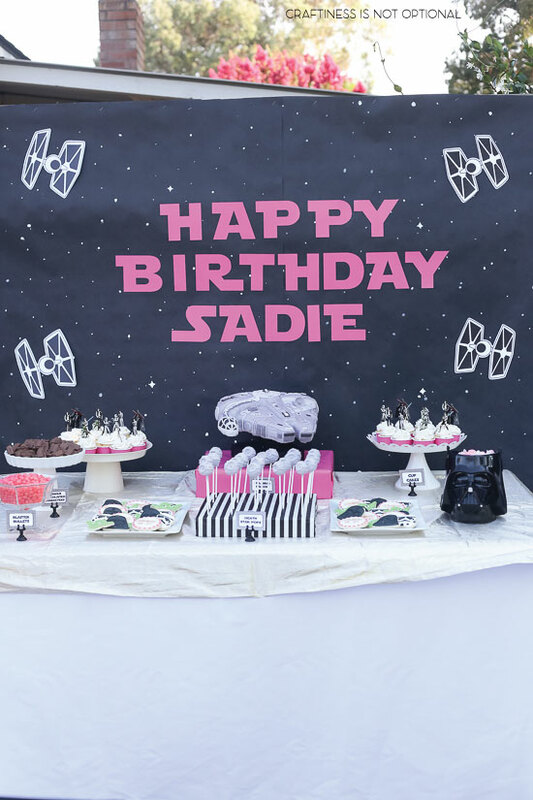 The backdrop was made with some wide black paper (lots of affiliate links in this post fyi! ), and my sister and I made dots “stars” with a few chalkboard pens all over. I LOVE how it turned out! The tie fighters I created in Illustrator, and I’ve uploaded the printable if anyone would ever like to use it! Just print and cut out! 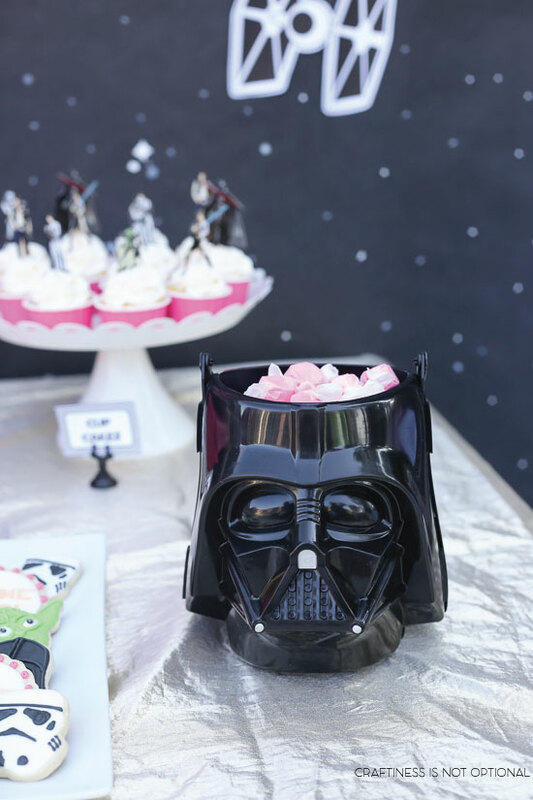 I found this hilarious Vader bucket and filled it with strawberry taffy. “Vader brains” someone called them. ew! but hilarious. 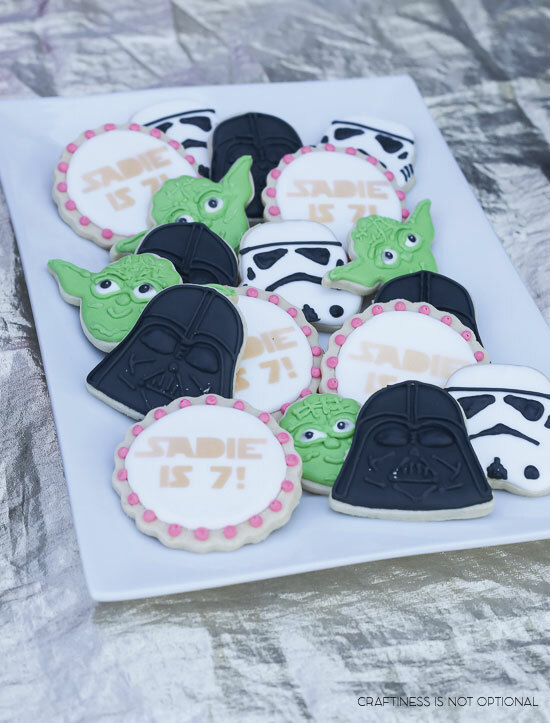 I used a few of my star wars stamp cutters-the stormtrooper, Vader, and Yoda…plus a scalloped circle that my sister airbrushed SADIE IS 7 onto…stencil cut out on the Silhouette! These were super fun to make! I love the Yodas! As usual these went really fast! 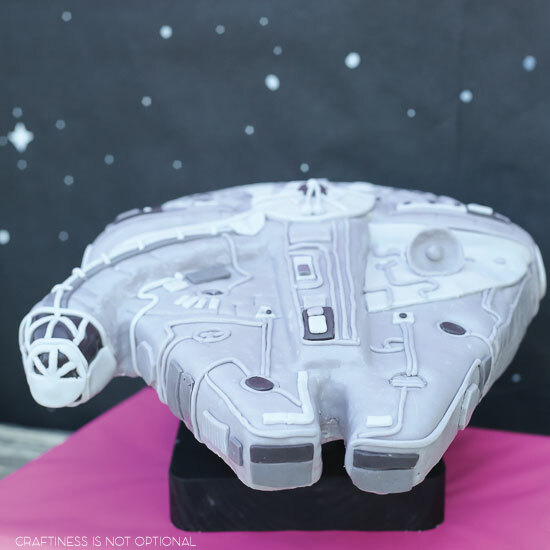 I made some vanilla cupcakes in these hot pink liners from Hobby Lobby, and then frosted them with buttercream and stuck in these AMAZING SW character toppers! I think they were from Williams Sonoma originally and I managed to nab them on sale last year. (one of the first things I purchased for the party! 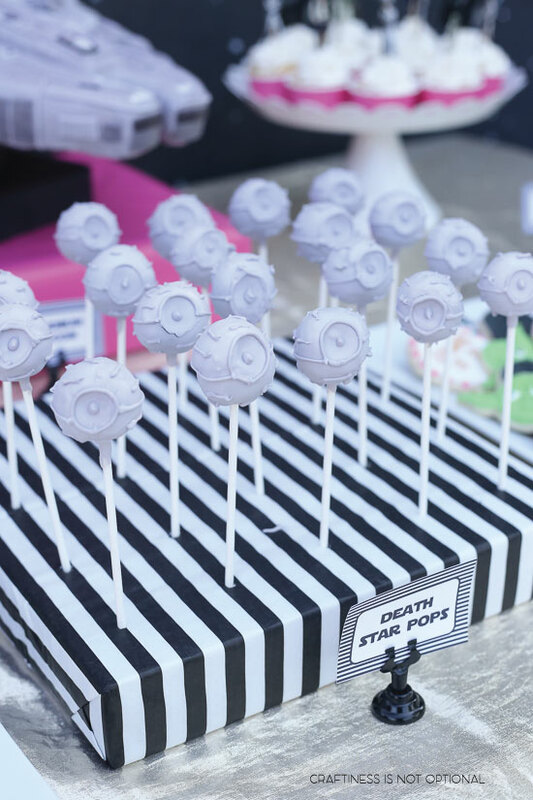 I also made these Death Star oreo pops! 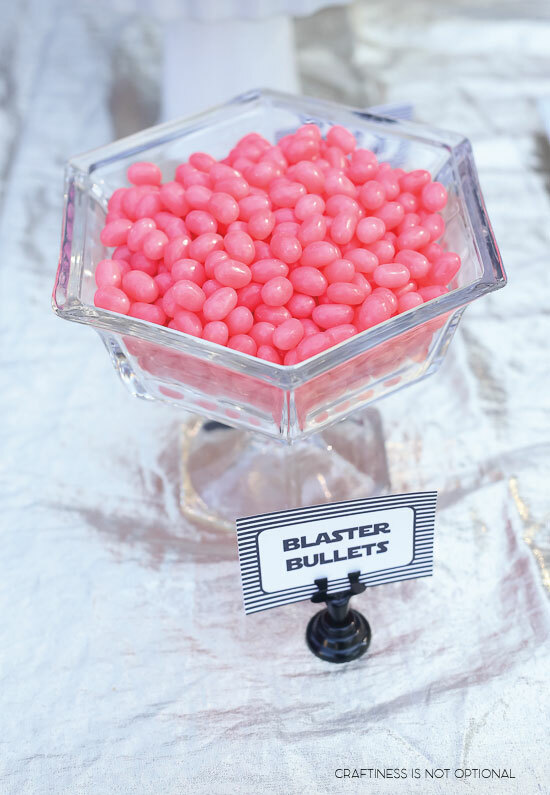 Kinda in love with these guys-I didn’t get to eat one-these went fast too, but it was SOO hot on party day that they were melting pretty quick. Luckily none of them melted down the sticks or anything, lol! Look, I know there is no such thing…but I couldn’t think of anything else to call pink jellybeans. lol! 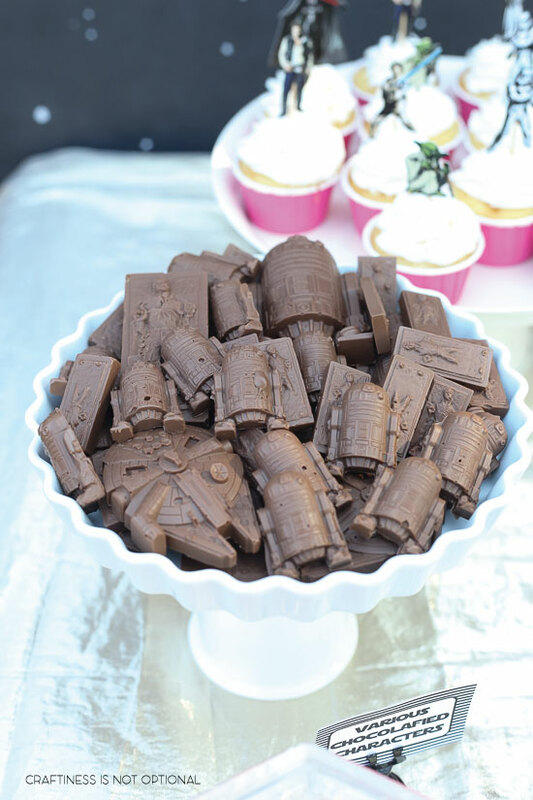 I used some AWESOME Star Wars silicone molds (millenium falcon, r2d2, and Han in carbonite) to make these “various chocolafied characters”. These also melted. Not into a pool of chocolate, no…they kept their shape, but if anyone touched them, splat. This chocolate actually tastes pretty good and it’s easy to use for molds! So I stuck these in the fridge and they firmed up perfectly, haha! whatever! TADA!! 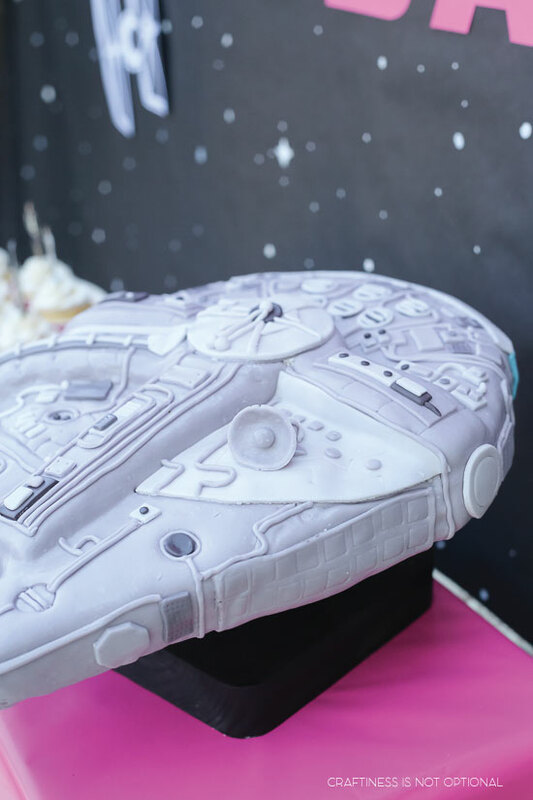 the pièce de résistance….a Millenium Falcon cake. 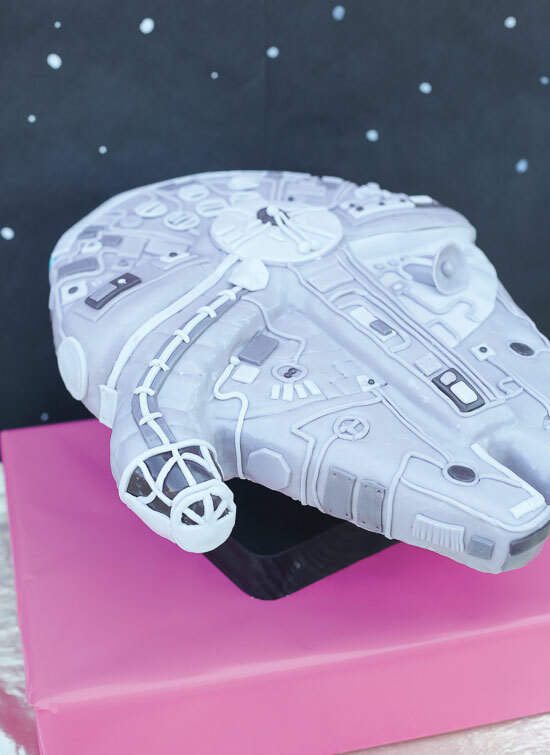 I won’t say much about this since I’m doing a whole post about it….but basically this is my crowning achievement in cake making. I’m pretty darn happy with how it turned out. Even better than I had anticipated! I’ll show you more pictures now! 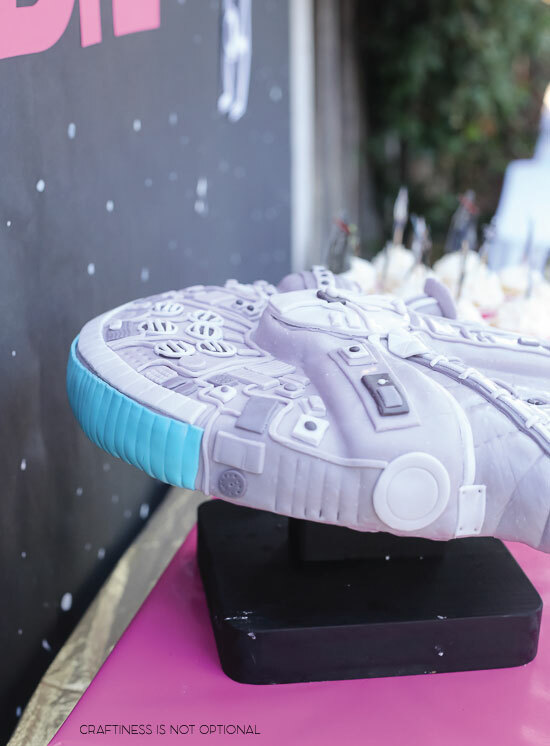 More on the cake in another post! grabbed some black table runners (great price and tons of colors btw!) 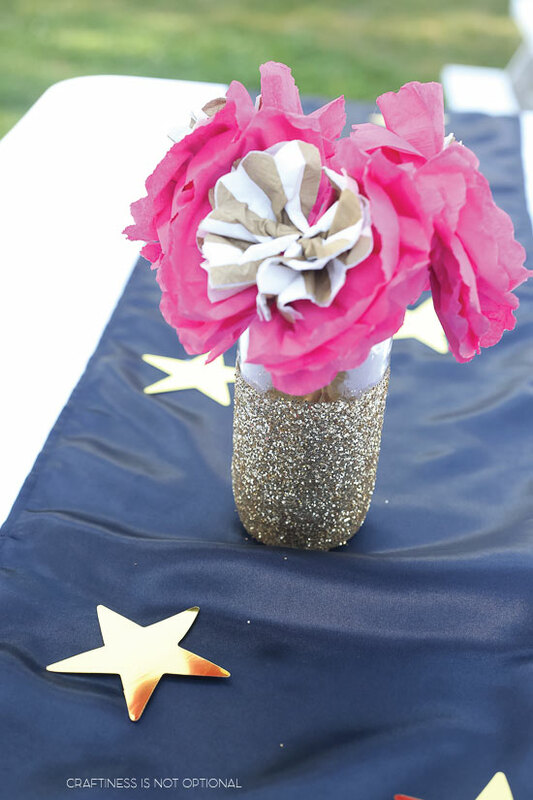 and gold stars for the table scape…I know it’s bordering on cheesy with the stars…but I couldn’t help it. haha. You know me and cheesiness. 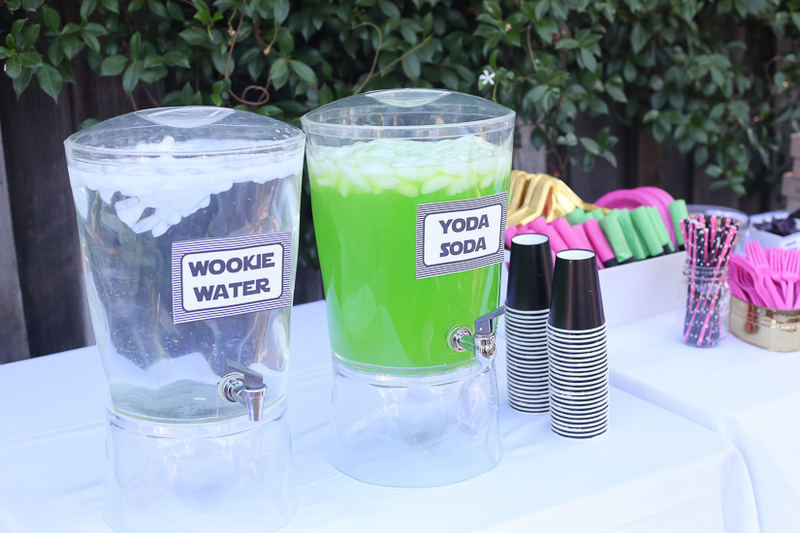 Served up some Wookie Water and Yoda Soda! I crack myself up. I found this amazing idea for napkins and the printable for it here! LOVE these! HAHAHA! get it? yah, I know Ima nerd. 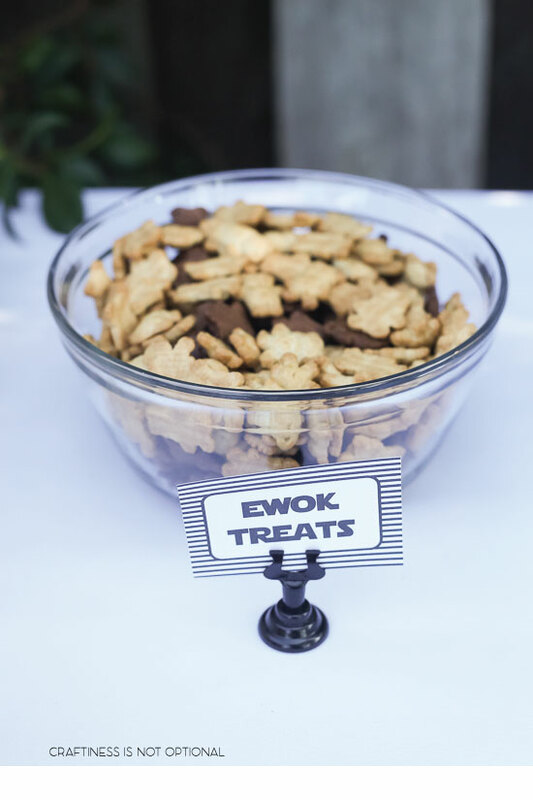 Set out some Teddy Grahams for “ewok treats!” I also had some more themed food, but it wasn’t out yet and I totally spaced on taking shots of it! boo! 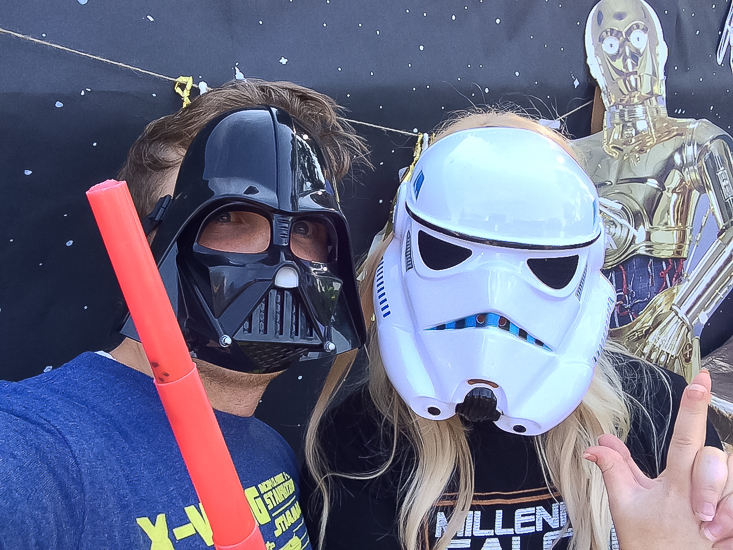 ANyway, we had “dark side chips” and Jango mango salsa….”Vader veggies” and dip…and Padawan Pizza for everyone! 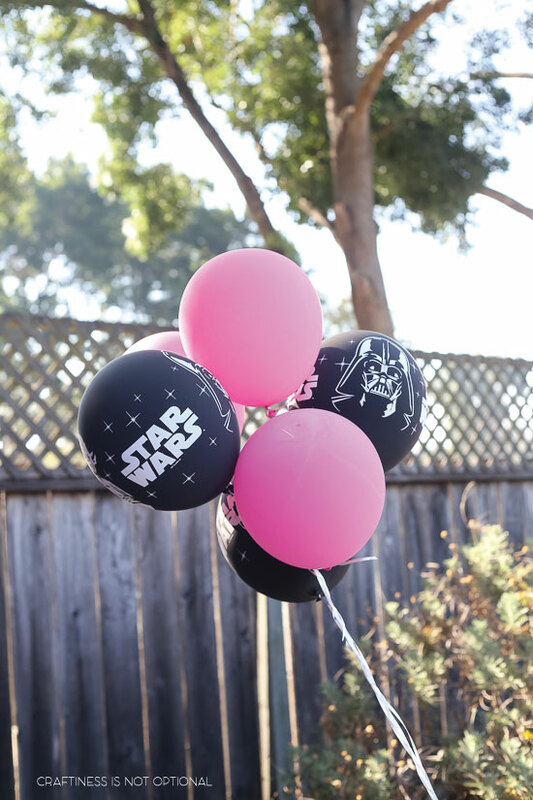 Also grabbed some fun SW balloons and some hot pink ones-loved the Vader ones! 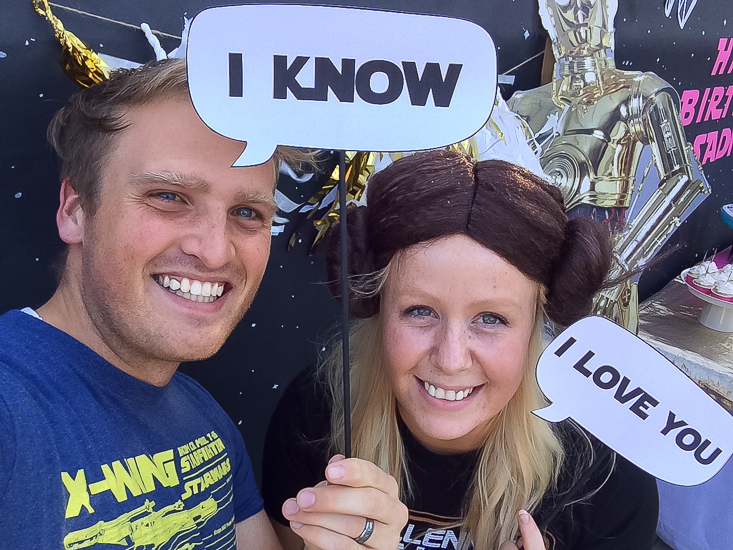 I set up a backdrop for pics (same as the table backdrop) and had some props readily available-a Leia wig, Stormtrooper mask, and Vader mask. ALso grabbed some (SOME, lol) of our lightsaber collection. 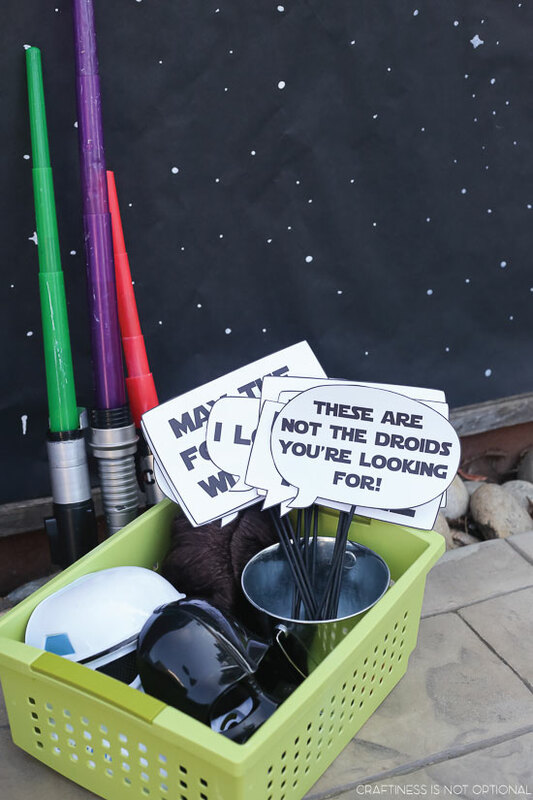 Made these funny star wars quotes for people to hold up…cut dowels and spray painted them, then glued to the back! 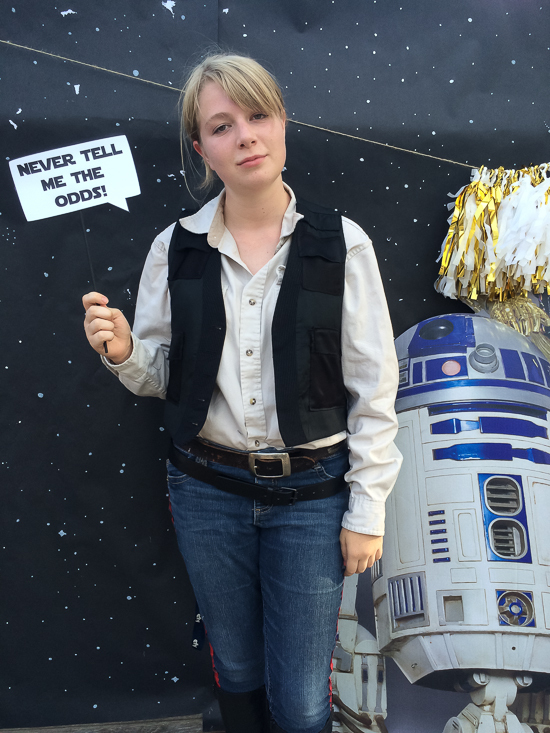 As you can see we had quite a few people dress as their favorite characters or in their best SW shirts! So fun! 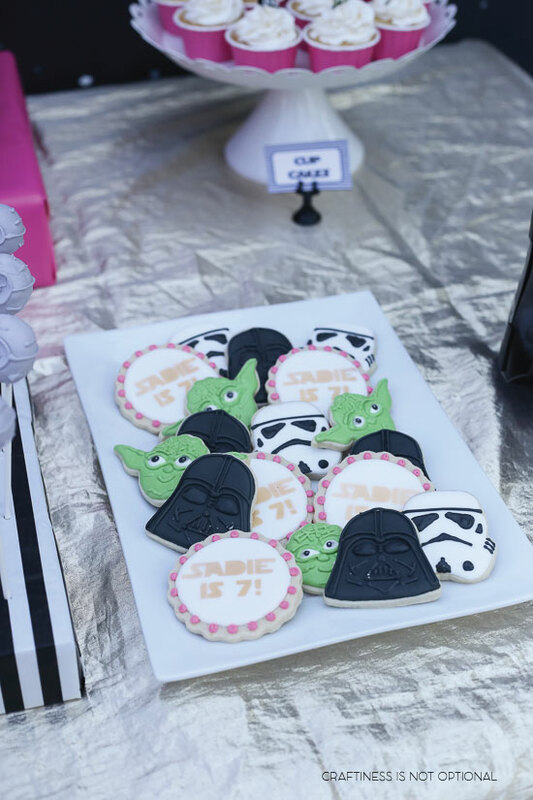 For the favor bags, I bought these black bags and filled them with star wars goodies! I love the R2d2 tag on front too…haha! 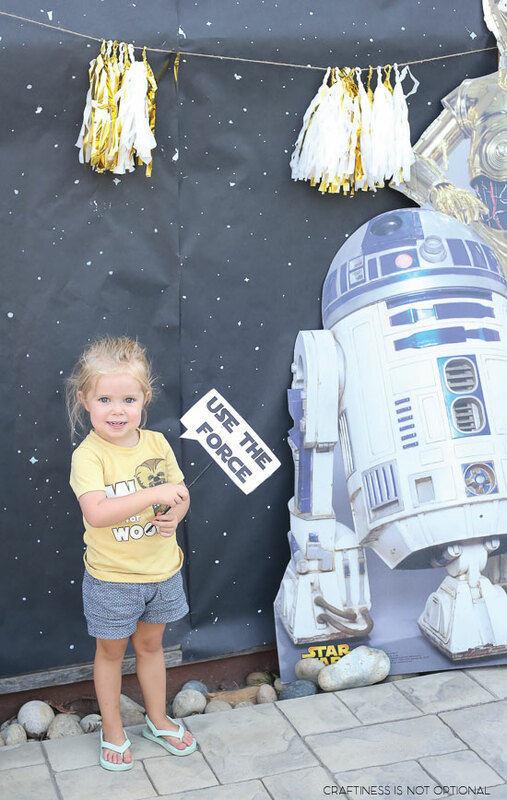 You r2 awesome! 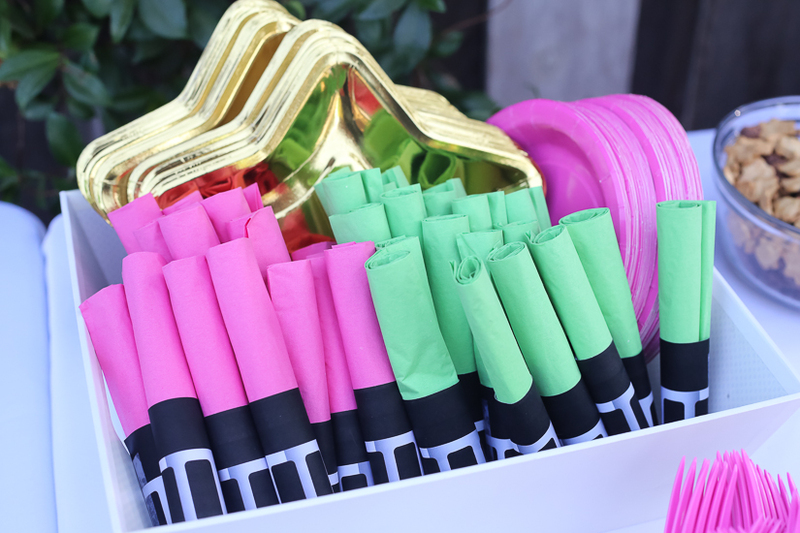 I found some solid candy sticks online and wrapped the bottom with the leftover napkin printables! LOVE THESE!! 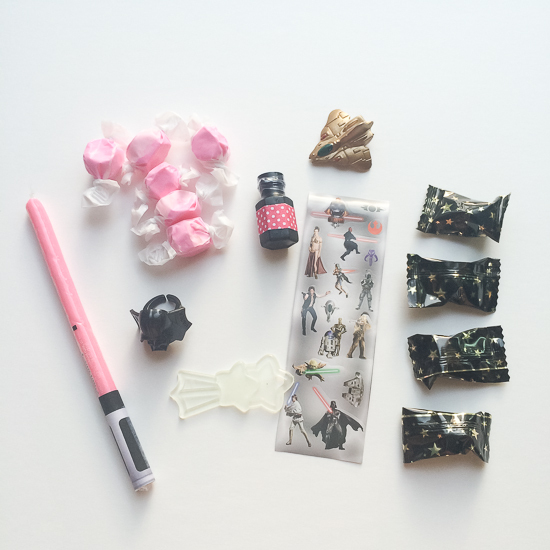 Also some more of that taffy….some bubbles, character rings…little spaceship and star toy…gold and black mints, and of course, star wars stickers! Absolutely amazing! Must have taken ages to prepare! 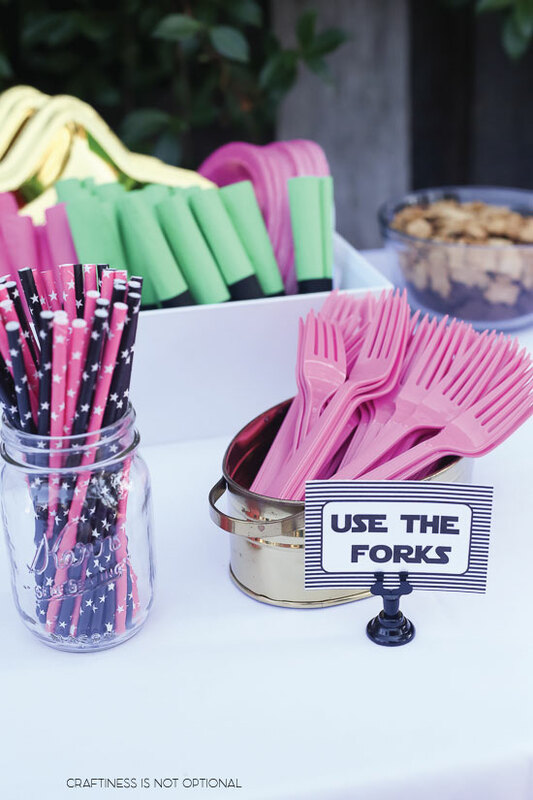 You outdo yourself with every one of these parties! As usual those cookies look amazing! 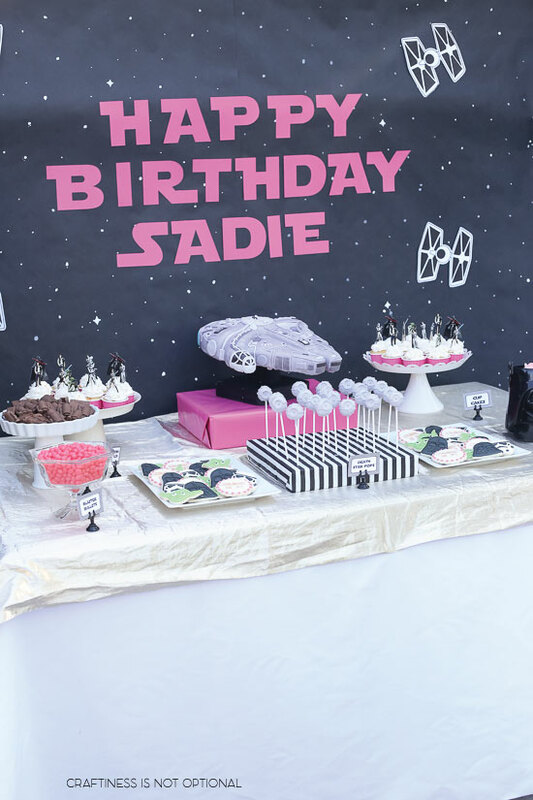 I’ve been drooling over your amazing party posts for years, and I always wonder if anyone ever throws you a birthday party. And if not, I would love to take on the challenge! But you’d have to come to Austin! Seriously though, it would be fun if there was a “Throw Jess a Party Contest” or something. I love everything about this! 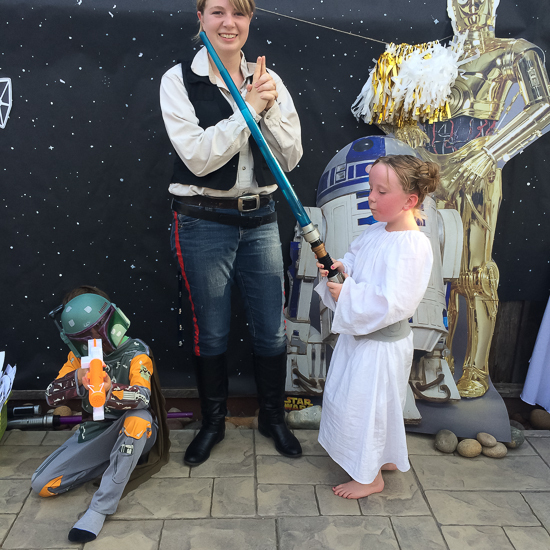 My two boys have each had SW parties and I think my daughter’s might be next year. 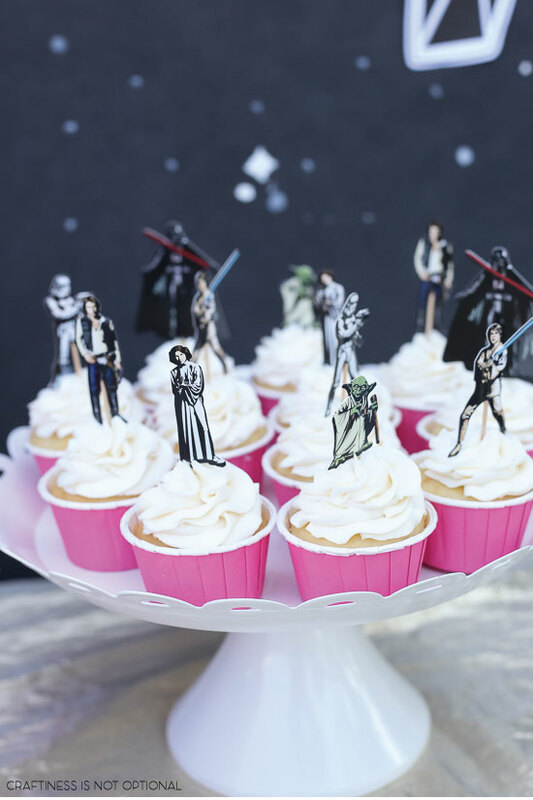 I got sad thinking we’d be done with SW parties until I realized we get to celebrate every May 4th! So many great ideas here! sooooo FUN !!!! really good things you’ve made ! 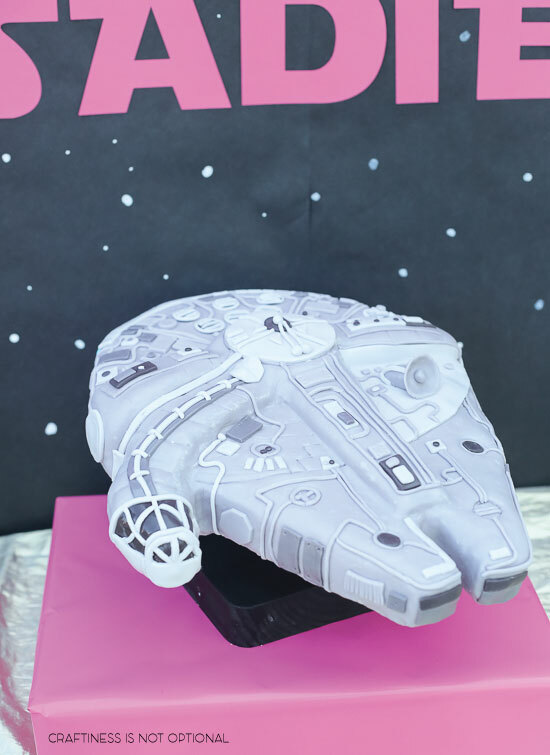 That cake is AMAZING!! WOW! The whole party is super cute!! You did a great job! i just can’t!!! so so so amazing!!! you are so talented! 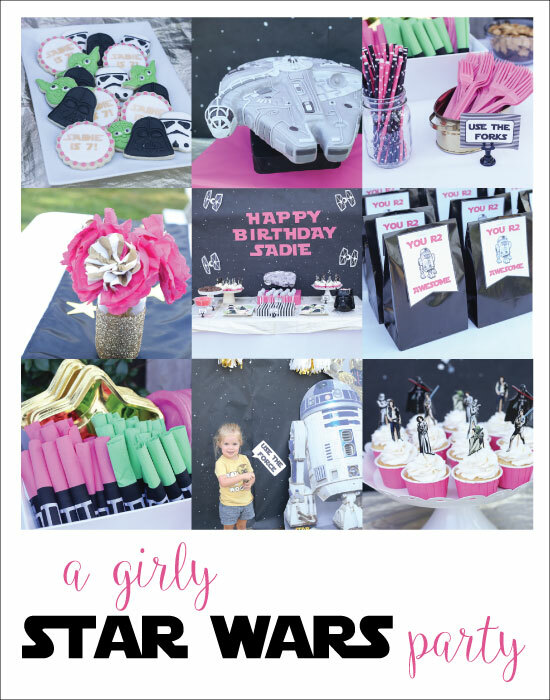 Question – how do you get the Star Wars font to make the “Happy Birthday” sign? I can’t find it anywhere. This is INCREDIBLE! 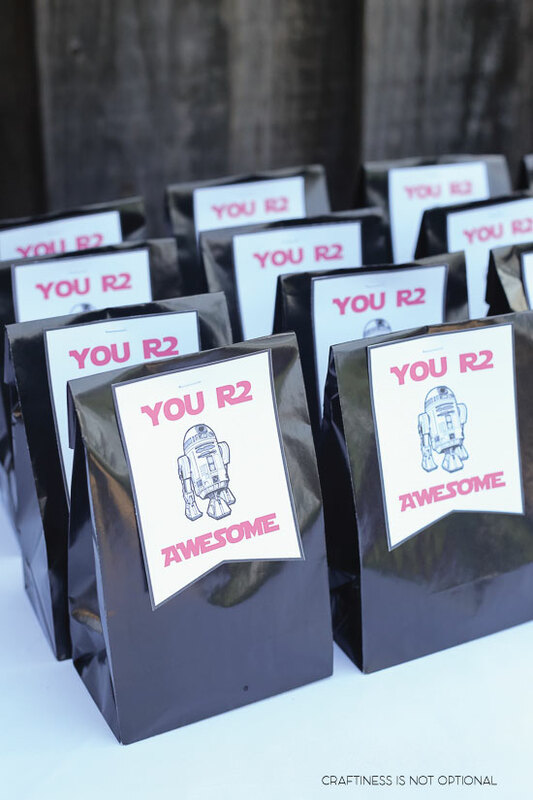 Can I ask, did you design the “you R2 awesome” label? 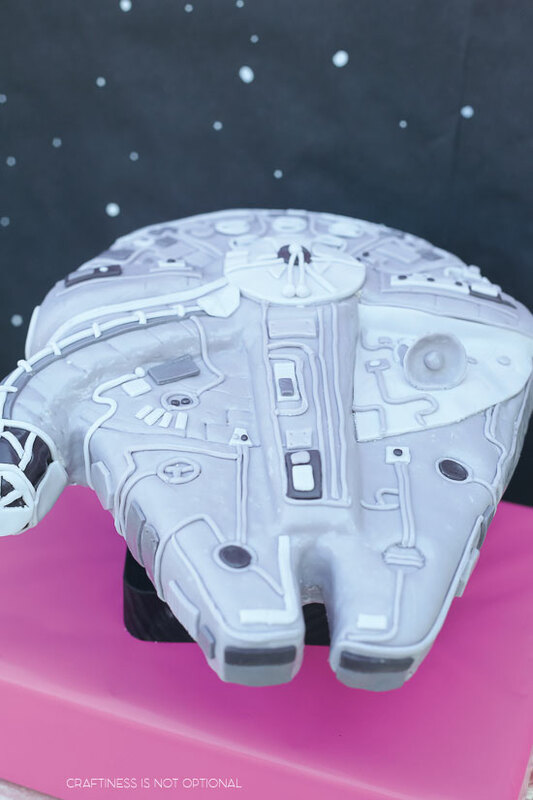 This IS the party I’ve been looking for! Thanks for all the links. I was looking at those molds on amazon but there were no decent example of what they would look like in chocolate. I love all your “nerdy” touches. 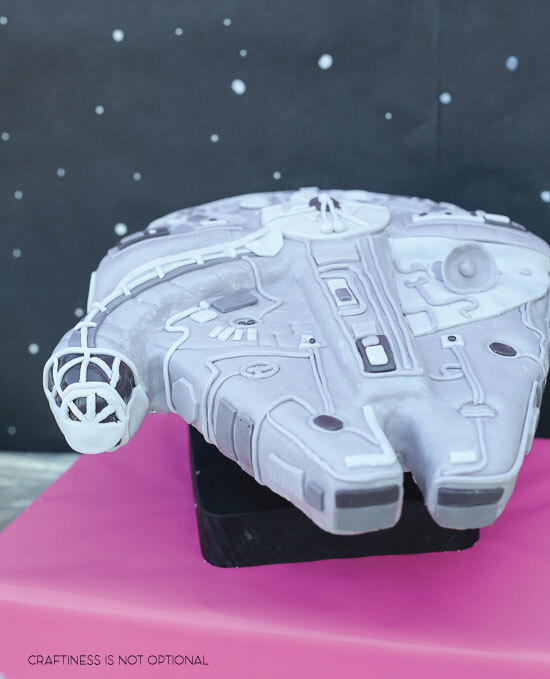 And that cake! Awesome!